I'm confused about what's going on here. Is the descending line from E5 flat to G4 the alto voice? Is the bass the 3rds in the bass clef and the tenor and soprano double at the E flat octave? Another thing: why is the first E5 flat played by two voices? This is a piano score. Forcing a voice-based analysis onto this piece makes no sense whatsoever (look, there's 5 voices!). If you had to analyse it as voices, I'd say that the top staff has the tenor voice as well as the other two. But please do not analyse it like that; it was written as a piano piece, and therefore the voices are just pieces of a tapestry of harmony. The E♭5 has two noteheads; therefore the two notes there should be played as only one note, and that's there to show the beamed three eighth notes to improve sight-reading. You could say it's another voice, but be careful not to start thinking in terms of SATB 4-voice harmony, which doesn't apply here. Basically, applying "tenor" to any part of the harmony makes for a very confusing analysis of what I am told is a very famous piano piece, in fact (thanks to Brian Chandler). This is a piano piece, and therefore assignment of notes to voice registers isn't particularly useful. With some composers there is little difference between their piano and choral writing, e.g. Schumann; but this is Brahms, who has a distinct and rich pianistic style of his own. You could divide all these elements into the standard choral parts and produce a piece for human voices, but it wouldn't make very much sense for various reasons (sound differences, voice ranges, text problems, etc.). In a piano solo, all the voices in the music are written on the same two staves, but the differences in stem direction will show when the voices have rhythmic independence. In the treble clef, the first quarter-note octave Ebs show that they are to be held while the D is played, and they are played again when the moving voice arrives at C. When the notes share a stem, it simply means those voices have the same rhythm at that point. 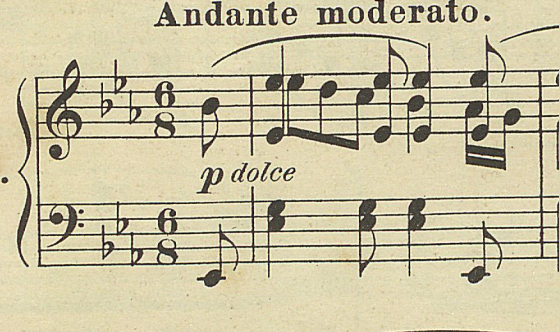 In this example, the moving voice is the melody, which would need to be brought out while the other voices creating the stacked chords should be in the background as supporting harmony. Parallel Fifths in Pachelbel's Canon in D? Why are scales built sequentially, rather than around the circle of fifths?